Placing an order couldn't be easier. 1. Select the category from the right column, or from the main Shop section. 2. Use the upper or lower pagination links to view other categories in the ship. 3. Click on the product you would like to view in greater detail, or, if you don't need to know any more you can simply click on the 'Add to cart' button beneath your chosen item. Some items will require that you make an attribute selection i.e. colour, size, format, etc. 4. By clicking on 'Add to cart' your chosen item will be added to the basket. 5. When you have finished shopping click on Checkout to start the check out process and follow the instructions. Registering your details on KateBush.com with us helps us to make the ordering process as quick and easy as possible for you and also allows you to keep track of your orders online in your account profile. No, not unless you sign up to KateBush.com News. If you do decide to sign up, you can unsubscribe from the mailing list at any time. This can be done in your account profile page. No, we will not pass your details on to other companies unless you tick the relevant boxes in your profile. You can request a new password by clicking here. If your password isn't working please contact admin@katebush.com. As safe as it possibly can be. We store any information you give us securely using high-level SSL encryption technology - the most advanced security software currently available for online transactions. We accept MasterCard, Visa, Maestro, Solo and Visa Debit or Connect. You can check the status of your order in your KateBush.com profile and clicking on the Orders tab. You will need to login to do this. I live abroad, how do I claim back VAT on my purchase? If you live in a country where you are exempt from VAT you will not have paid VAT on your order. VAT is only added to orders from countries where it is applicable and deducted from countries where it is not. Please contact out Customer Services team via email at shop@katebush.com for help with any problems. Some of the items on our website are popular and do sell out quickly. Unfortunately we are unable to tell you if we will be getting more of a particular item but it's worth checking back regularly. The item I want is out of stock online, can I order it any other way? If an item is out of stock you will unfortunately not be able to order it. No, you can't. But please check back regularly as the item you're after may be re-stocked. You must be 18 years or over to shop at KateBush.com. If you are younger you may shop but only with the consent of a guardian or parent. Orders to the mainland UK are shipped 1st Class. Royal Mail aim to deliver this the next working day but we advise allowing up to 20 days for your delivery to arrive. Royal Mail aim to deliver orders to European destinations within three working days and worldwide within five. Again, we strongly recommend allowing up to 20 days for your delivery to arrive. I've still not received my order, where is it? If your order was placed less than 20 days ago please allow a little more time. It takes up to five days for your order to be processed and may take up to a further 10 working days for delivery via Royal Mail. If your order was placed more than 20 days ago please contact customer services at shop@katebush.com who will be able to help. You can check the status of your order in your KateBush.com account profile. You will need to login to access this. When you opt for your preferred delivery method, before you checkout online, the delivery options will state whether or not your chosen method requires a signature. What happens if you deliver whilst I am out? If they have not been able to make your delivery our Royal Mail courier will leave a card to let you know they called. You will then need to make arrangements to collect your delivery as advised by Royal Mail. You cannot change the delivery address of your order if you have already received the email informing you that your item has been despatched, as it is already underway. If you have not received this email it may be possible to change your delivery address. Please contact shop@katebush.com who will be able to help. Yes. We deliver worldwide. Please be aware that deliveries outside of UK may be subject to import duties and taxes which are levied when the delivery reaches the specified destination. It is your responsibility to pay these fees if they are incurred. If you are unsatisfied with your order when it arrives you may return it to us. Your order must be in the same condition in which you received it. We will refund you the full cost of the product and the cost of sending the item to you, however you will be responsible for the cost of returning the item to us. Please note this does not apply to digital products, or to products made to your specifications, or which have been clearly personalised. I have received my order and it is faulty. In the unfortunate event that your order is faulty when it arrives you must notify us writing with 10 working days of the delivery of your order. We will send you a Freepost return label for the items so that you can send your order back to us. As soon as we receive your retuned item we will inspect it and if required will send a replacement to you free of charge. Please remember to ask the Post Office for your proof of posting certificate and retain it for your reference. Please allow 30 working days for your parcel to reach us and for your account to be credited with your refund. What do I do if there is a problem with my return? Please contact shop@katebush.com who will be able to help. You will have to pay for the cost of sending us your returned item. If the item is faulty or has been received in error we will send you a Freepost bag which you can send your item to us in. I bought an item online but it is now faulty, what can I do? 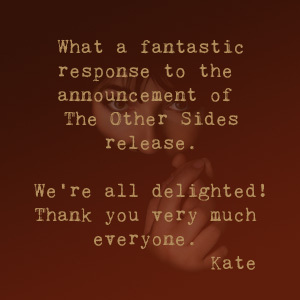 Please contact Customer Services on shop@katebush.com who will be able to help.